Facial bones are derived from cranial neural crest cells (CNCs) which reside in branchial arch 1 (BA1). 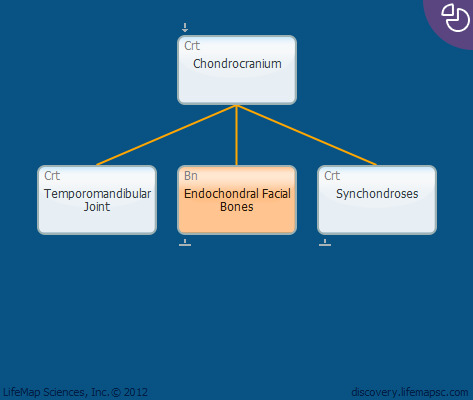 Facial bones that ossify through endochondral process, include the temporal, sphenoid, zygomatic, and basioccipital bones and are part of the cranial base. Endochondral ossification involves a cartilaginous template that is replaced by or remodeled into bone by processes that involve several coordinated steps that can include calcification of the cartilage matrix, hypertrophy of chondrocytes followed by apoptosis, resorption of calcified cartilage, recruitment of osteoblasts, and deposition of woven bone (and later lamellar bone) on the surface of mineralized cartilage residues.